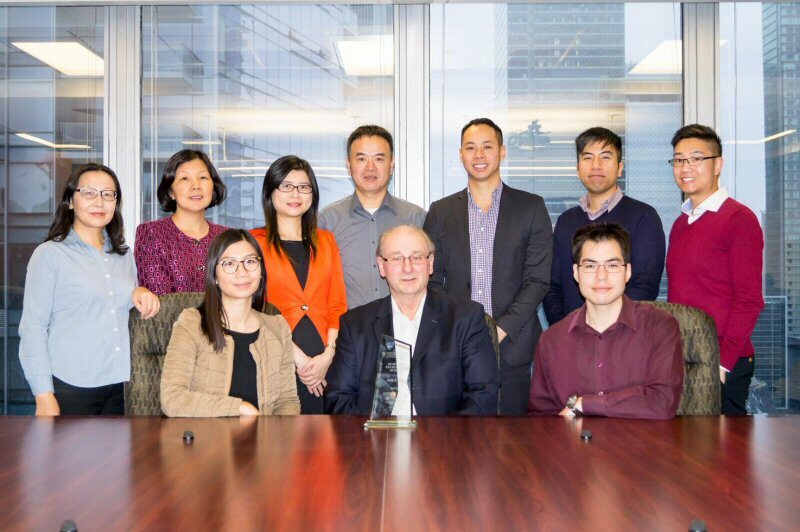 Century Global Commodities Corporation (TSX:CNT) ("Century") is pleased to announce that it has received the 2016 Silver Business Excellence Award for Professional, Scientific and Technical Services from the Canada China Business Council (CCBC). The award was presented to Century during CCBC's 5th Gala Luncheon held in Toronto last Friday. 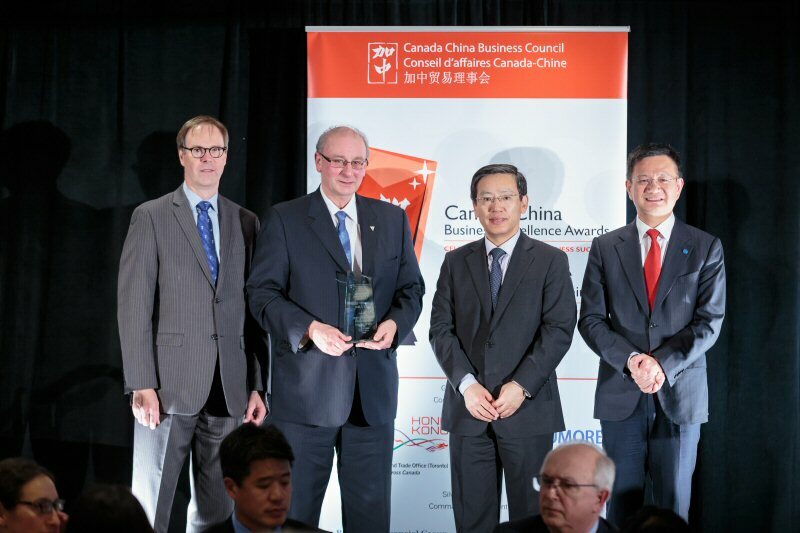 Every two years, the Canada China Business Council presents Business Excellence Awards to recognize companies that have played an innovative and leadership role in expanding and nurturing bilateral business relationships between Canada and China. The Silver Award for Professional, Scientific and Technical Services is given to an enterprise "that demonstrated the successful inclusion of China in the company's growth and their overall business strategy." The award recognizes Century's development of a mining database that is focused on gold and copper and includes some 1,500 mining companies and 3,500 mining projects. The companies included in the database are listed on major international capital markets including TSX, ASX, HKEX, LSE and the NYSE, and the database is for use by individual investors, mining professionals and companies seeking mining property acquisitions. A unique feature of the system is that all data is accessible in both Chinese and English and commercial sales of the system are planned in Canada, China and elsewhere. Development of the mining database is consistent with Century's new direction to increase shareholder value, which includes maintaining and advancing its mining activities as well as developing new opportunities in non-ferrous mining, in mining services and in the food business in Hong Kong and China. Sandy Chim, President and CEO said "We are very honoured to receive this Award. I additionally want to thank our employees for the many hours they have contributed to make the web based system an effective and viable commercial tool. Also I would like to recognize our Chinese strategic partners, WISCO, Minmetals and their teams, who have invested in Century and our projects, for the unwavering support they have extended to us over the years. Sandy Chim went on to say "I also salute CCBC and its important and outstanding role in nurturing the good business relationships which create mutual economic benefits for both Canada and China." The Canada China Business Council is the country's Canada-China bilateral trade and investment facilitator, catalyst and advocate. Founded in 1978 as a private, not-for-profit, non-partisan business association, CCBC provides unparalleled insight into Sino-Canadian trade and investment issues and develops connections that ensure its members' business success. In addition to its focused and practical services, the Council is also the voice of the Canadian business community on issues affecting Sino-Canadian trade and investment. With WISCO and Minmetals, both Global Fortune 500 Chinese strategic partners, Century owns one of the largest iron ore mineral resource bases in the world, across five projects in Quebec and Newfoundland and Labrador. Joyce Lake, a direct shipping ore project in Newfoundland and Labrador, is our most advanced project. It has completed feasibility and permitting studies and can be brought to production within approximately 30 months. We are maintaining our properties in preparation for a return to higher iron ore prices. Century is monitoring investment and acquisition opportunities. When the right opportunity presents itself, our strong balance sheet will allow us to invest or acquire undervalued assets during the current down-cycle, positioning ourselves for gains when the market improves. Quality food products sourced from advanced countries are in great demand from the quickly-growing middle class in China. The emphasis is on the need for safe, high-quality food products. Century has established a professional marketing team and built a distribution system to serve Hong Kong and eventually mainland China. Initial successes include contracts with one of the largest egg producers in Australia and supply contracts with hotels, restaurants, grocery chains as well as an international airline. THE FORWARD-LOOKING INFORMATION CONTAINED IN THIS PRESS RELEASE REPRESENTS THE EXPECTATIONS OF CENTURY AS OF THE DATE OF THIS PRESS RELEASE AND, ACCORDINGLY, IS SUBJECT TO CHANGE AFTER SUCH DATE. READERS SHOULD NOT PLACE UNDUE IMPORTANCE ON FORWARD-LOOKING INFORMATION AND SHOULD NOT RELY UPON THIS INFORMATION AS OF ANY OTHER DATE. WHILE CENTURY MAY ELECT TO, IT DOES NOT UNDERTAKE TO UPDATE THIS INFORMATION AT ANY PARTICULAR TIME EXCEPT AS REQUIRED IN ACCORDANCE WITH APPLICABLE LAWS. 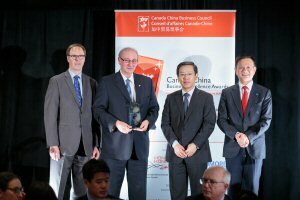 Mr. Peter Jones (second from left), Executive Vice-President receiving the Award from representatives of Canada China Business Council. Century Global Commodities team in Toronto, Canada.